The GII is a global comparative study of 142 countries undertaken each year by Cornell University, INSEAD and the World Intellectual Property Organisation (WIPO). As shown in the diagram below Australia is ranked within the global innovation leaders’ group. This is based on Australia’s GII scores and gross domestic product (GDP) per capita expressed in purchasing power parity dollars (PPP$). It can be seen that Australia falls towards the bottom of the Leaders’ group with an overall GII ranking of 19. This is below New Zealand with a GII ranking of 17, and outside the top 10 countries which consisted of: 1) Switzerland; 2) Sweden; 3) the United Kingdom; 4) the Netherlands; 6) the United States; 6) Finland; 7) Hong Kong; 8) Singapore; 9) Denmark and 10) Ireland. This 2013 GII ranking is an improvement for Australia which ranked only 23 in 2012. However, we continue to be classified as an inefficient innovator. 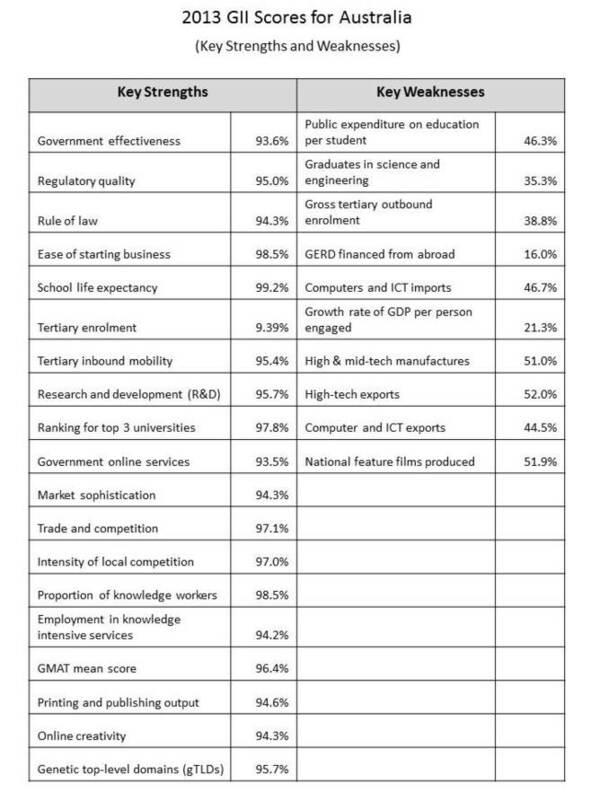 As shown in the following table Australia’s key strengths lie with its institutions, particularly the effectiveness of government, quality of the regulatory system and rule of law. It is also recognised as an easy place to start up a new business. 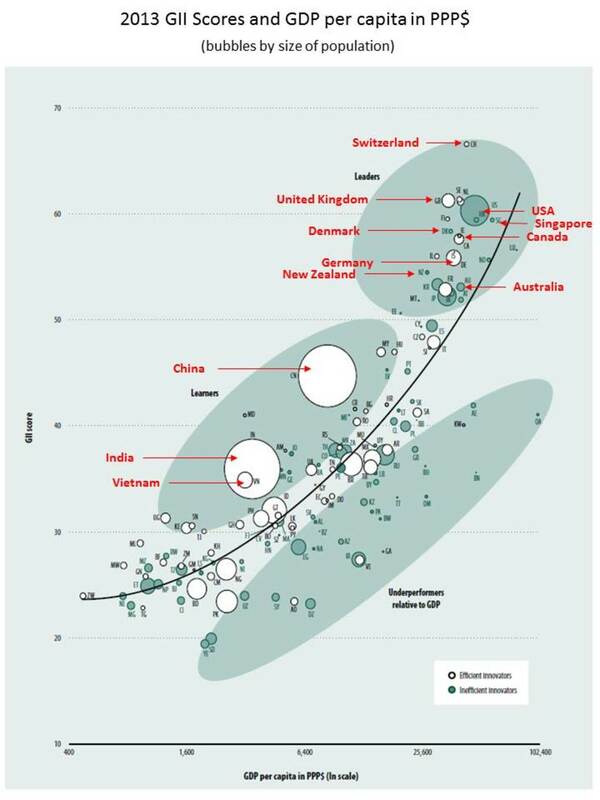 Australia also performs well in relation to its higher education system with the universities ranking well and relatively good flows of investment into research and development (R&D). However, the per capita expenditure of public money on education and the successful completion rates from universities were an area of weakness. In particular the number science and engineering graduates Australia’s universities produce. While Australia ranked well for some aspects of its market and business sophistication it was weakened by the proportion of its Government R&D financed from overseas and the amount of computer and information and communications technology (ICT) that it imports. Australia also falls down in terms of the quantity of high-technology products it manufactures and exports as well as the export of ICT and computer equipment. A feature of the federal government’s Job’s Plan is a recognition that Australia must build its future on innovation. As outlined in A Plan for Australian Jobs, “The Government’s vision is for Australia to have an innovation system in the top 10 globally by 2025”. One of the mechanisms to achieve this goal is the creation of a series of 10 “Innovation Precincts” across the country. These will be designed to bring together researchers, businesses and government agencies to help foster enhanced innovation and thereby boost Australia’s international competitiveness. The focus of these precincts or what are internationally called “innovation hubs” will be areas of perceived existing competitive advantage. The first two innovation precincts have already been established. One is in south east Melbourne and the other in Adelaide. 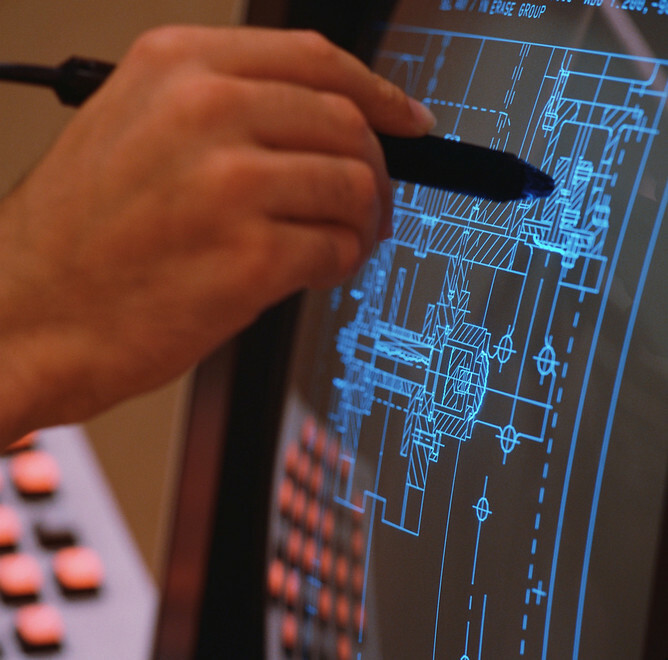 These are focused on manufacturing. A third precinct focused on food is being established in Melbourne. Whether these innovation precincts survive the election is unclear but it seems likely. The model of such precincts or innovation hubs is well recognised globally as a useful strategy. The GII 2013 report refers to these innovation hubs as “vital components of national and regional economic strategy”. However, they are not easily created and each country has a different experience in their formation. The most commonly recognised model is that found in the United States. This sees the innovation hub formed around one or more research universities or institutes. These draw together a community of entrepreneurial start-up companies and associated support systems including venture capital providers. Yet in Asia the experience in South Korea has been that of government directed R&D funding state sponsored research programs. Other models can be found but according to the GII a common pattern emerges that highlights the need for “enterprise champions”. These are typically large firms (e.g. Hewlett-Packard, Lockheed, Xerox, Samsung, LG) that can serve as key actors in the innovation hub and assist other firms to gain international market access. The presence of a major globally competitive company within an innovation hub is important. They can act as an enterprise champion and make a significant difference to the innovation and competitiveness of the local firms in their network. In addition to acting as a lead customer for many firms, these enterprise champions also attract high quality managers, skilled workers and best-practice technologies into the local economy. The GII study suggests that national governments seeking to foster successful innovation hubs need to address 10 key issues in their design and implementation. First, there should be a national plan for the development of a knowledge economy, including the transfer of technology and diffusion of innovation. Second, governments should invest in innovation projects in conjunction with the private sector. This can involve provision of infrastructure and the fostering of knowledge sharing and communication within the innovation hubs. A third issue is the need to ensure that there is sufficient financial capital available to fund commercialisation programs. This can take the form of venture capital or other forms of financing. The fourth issue is the need for the government to make it easy for business start-ups to form and to foster the growth of small firms through appropriate taxation, skilled worker visas and intellectual property laws. Government also needs to ensure that such innovation hubs are based on sound foundations in which the existing industries are globally competitive and complement other hubs. The final five issues that government policy should address lie within the implementation of the hubs themselves. Such hubs should be located where they can find a “natural fit” within existing businesses and associated infrastructure. There should also be a framework for the governance of these hubs that encourages synergies between the firms that lie within them. Policies designed to foster greater linkages between university research centres and industry are important. This should include collaboration over R&D and the transfer of technology. It is important that innovation hubs are designed to attract foreign and domestic investors over the longer term. There should be services and support systems that make relocation into the hub attractive for business. Support to local small firms in the form of financing and logistics or training and export development are also important. Can Australia compete in the global innovation race? The resources boom that followed so closely on the heels of the Global Financial Crisis did much to help keep the Australian economy buoyant. However, the resources boom has now peaked and the reality of a high-dollar economy, lying within the outer fringes of the Asia Pacific, is beginning to impact. There is no reason why Australia cannot build a successful innovation driven economy despite its higher labour costs. However, it will need to make some adjustments to its public policy debate and national psyche. Of particular importance is the need to find suitable enterprise champions. Australia lacks the major global manufacturers that are found in Asia, Europe and North America. This will be a challenge and the country may need to rely on attracting and retaining major international firms to invest here. Australia will need to create an attractive environment for global firms for this to happen. Low labour costs are unlikely to be the solution. The focus will need to shift onto knowledge and human capital. The creation of an innovation driven, knowledge-based economy requires a much greater investment in education and training, particularly at the tertiary level. As shown in Australia’s 2013 GII performance, there is more than could be done to lift the level of public expenditure in education and the development of graduates in science and engineering. We will not be the only country following this path. Our long term ability to maintain our living standards and offer high quality jobs to our children will depend on the decisions we make today. Tim Mazzarol is President of the Small Enterprise Association of Australia and New Zealand (SEAANZ). This article was originally published at The Conversation.